The AN20MA-2 is designed to connect easily to a FMD or F-series PLC and converts up to 2 channels of 0-5V analog output voltage from the PLC to 0-20mA current loop for controlling external 0-20mA or 4-20mA devices. AN20MA-2 also converts up to 8 channels of 0-20mA or 4-20mA analog signals from field devices, remote sensors or other controllers into 0-5V analog input signals that the FMD or F-series PLC accepts. ▸ AN20MA-2 is not designed for direct connection to T100MD+ or T100MX+ PLCs due to different location of the analog output pins on T100MD+/T100MX+ PLCs. 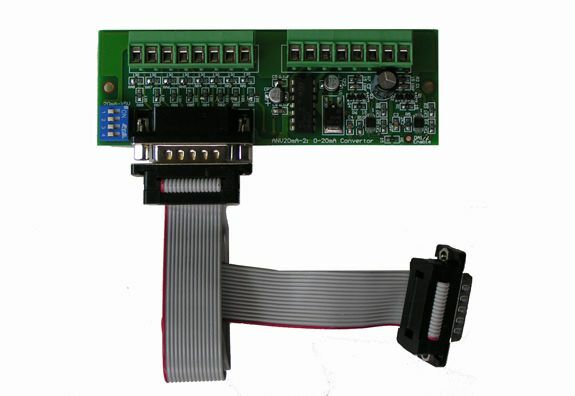 ▸ A 30 cm (1 ft) long DB15 male-to-female connecting ribbon cable is included with the AN20MA-2 for quick connection to the PLC's analog port. Two blocks of 8-pole, detachable screw terminal provides simple wiring of analog field devices AN20MA-2.